Rather than write a summary of someone else's post and site them for credit for their research, I thought I would just provide the link to her blog instead. Mommy Points has an excellent post on some last minute donations to different charities while earning miles and points in the process. Here is a parital list of the charities. For more details click here. There are also several charities to help with Hurricane Sandy relief and Haiti hurricane relief. Here are the Airlines and Hotels who are participating. Thanks to Mommy Points for her research. Today's post title is a bit tongue in cheek. I wanted to prove a point about how credit card churning has little to no effect on your credit score and can actually improve your score if properly executed. I recently did my final App-o-Rama of 2012. I applied and was approved for three cards; The Chase Ink Plus, the Citibank AA Business card, and the Bank of Hawaii Hawaiian Airlines card. It's this last card I would like to expand upon a little bit more. The Bank of Hawaii card came with 35,000 Hawaiian Airline miles as a sign up bonus for a minimum spend of only $1000. I received this card two days ago. One simple trip on my way home yesterday to CVS to buy two $500 Vanilla Reload cards, and I met the minimum spending requirement. For $7.90 (the cost of two reload cards) I got 35,000 miles. Those could be used for a Super Saver fare to Hawaii. They can also be transferred to Virgin Atlantic and then converted to 70,000 Hilton points. (probably not the best use of them). You can also fly on Virgin to Europe with Hawaiian Airlines miles with no fuel surcharges. Now to today's point. With my Hawaiian Airlines credit card came a credit score from one of the credit bureaus. My score has actually gone up to 803 with this latest round of card applications. I have been approved for around a dozen cards this year. Let me repeat that. My score has actually gone up after applying for 12 credit cards in one year! This isn't because I did anything special. I just pay my bills on time every month. You can do it too if you just follow my prescription. Last month I wrote about Bluebird, "The New Killer App" and " Is Bluebird Worth it Now?" To summarize those articles, Bluebird is a new product by American Express that acts as both a debit card and a checking account. The idea behind earning miles and points is to purchase Vanilla Reload cards with a points earning credit card at Office Supply stores and Drug stores where you earn up to 5X bonus points per dollar spent. You can then pay bills like mortgage and car payments, utility bills, etc. from your Bluebird account. You are then essentially earning points on bills that you can't typically pay with a credit card. There have been stories circulating the Internet of difficulty setting up Bluebird, trouble with the Vanilla Reloads posting to your account and worries that bonus points for the purchase of Vanilla Reload cards would not post to your account. I am pleased to announce that after more than a month of use of my Bluebird account and purchasing Vanilla Reload cards, I have had none of these issues. My Hilton credit card statement arrived last week and 6X Hilton points per dollar spent on Vanilla cards were posted. The bill pay feature of Bluebird is VERY easy to setup and use. This comes from someone who up until now has never paid bills online. Rest assured the Bluebird strategy for earning miles and points on bill paying is still alive and well for now. Last night was my final mini app-o-rama of 2012, wrapping up a very successful year of accumulating just north of 2 Million miles and points. The cards for which I applied and were approved for were the Chase Ink Plus (50,000 Ultimate Rewards point bonus after a $5000 spend in the first 3 months), the Citibank American Airlines Business Visa (40,000 AA miles after the first $3000 in spending and another 10,000 bonus miles after the first $10,000 in spending and lastly the Bank of Hawaii Hawaiian Airlines Visa. (35,000 Hawaiian Airline miles which I could convert to 70,000 Hilton points). I was instantly approved for the Citibank and Bank of Hawaii cards. I received an "under review" message for the Chase card. I immediately called the Chase reconsideration line (1-800-453-9719) and in approx 10 minutes got approval for that one as well. Most times when you don't get instant approval, it is because they just want more information. They asked me to verify a couple of income questions and asked me how much I would be spending on the card each month. One minute later I was approved. By matching up my travel needs with the proper use of spending to maximize bonus points, in 2012 I accumulated over 2 Million miles and points. This was from a combination of sign up bonuses, generic credit card spending, and bonus points received from credit cards like Chase Ink Bold and Sapphire as well as the various Hilton cards I have. Tomorrow we will discuss "The Best Cards For Big Spenders". What cards will you apply for in 2013? Did you know that you can book short to medium distance non-stop flights like NYC to Miami for as little as 15,000 miles round trip? Or how about NYC to some of the islands in the Caribbean for 20,000 miles round trip? What about LAX to Honolulu for 25,000 miles? 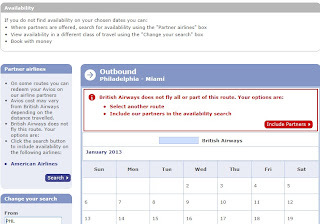 You can if you know how to use British Airways Avios to book flights on American Airlines. DFW (Dallas)– MCO (Orlando) 15000 points RT for a Disney World vacation. DFW – DEN/EGE (Denver, Vail) 9000 points RT for a ski vacation. Both British Air and American Airlines (AA) are part of the One World Alliance. 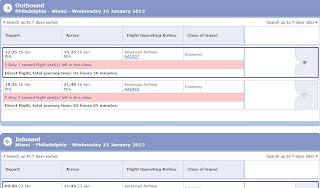 British Airways flies from a multitude of US cities to destinations in Europe, The Middle East, and Africa through London (LHR), however British Airways is not permitted to fly within the United States. You can however book travel within the US using your British Airways miles (Avios) while flying on partner American Airlines. 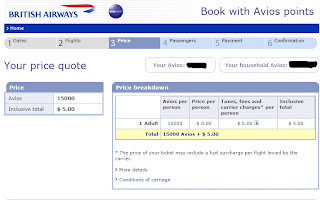 Because British Airways uses a distanced based chart to determine how many miles are necessary to book award travel, you can find award flights to nearby destinations for as little as 9000 Avios RT. 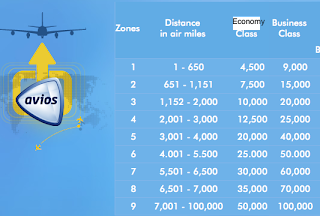 Considering that American Airlines award chart starts at 25,000 miles, that's a really good deal! Business class tickets are twice as many miles as Coach tickets and First class tickets are 3X coach awards. 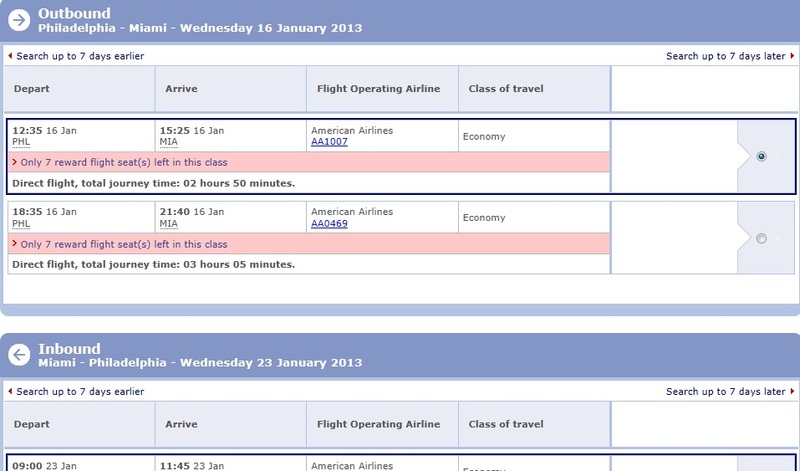 In some markets, there is no true first class and you may be charged 3X miles for a business class seat. It can still be a great deal. 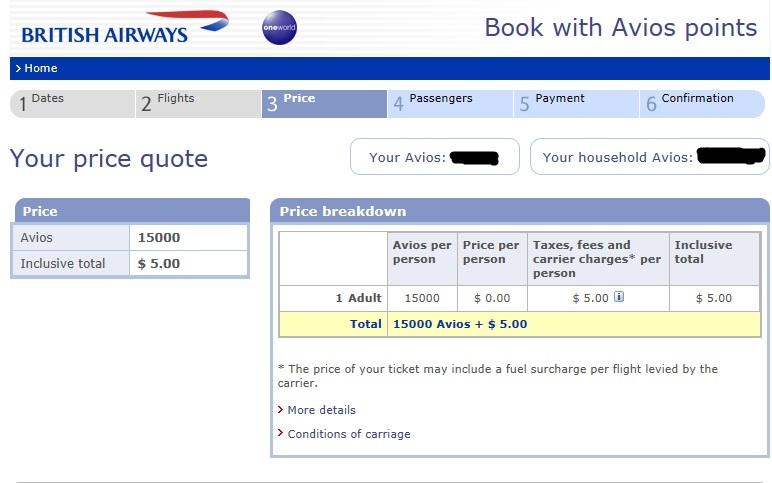 Here is the step by step directions for booking AA flights with Avios. First you have to be logged into your British Air Account. 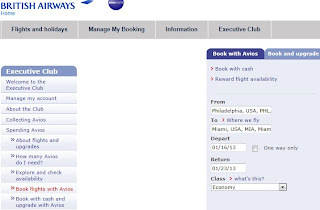 Once there, click on "Spending Avios"
Next Click on "Book Flights with Avios" . Fill in your departure city and destination city and dates of travel. 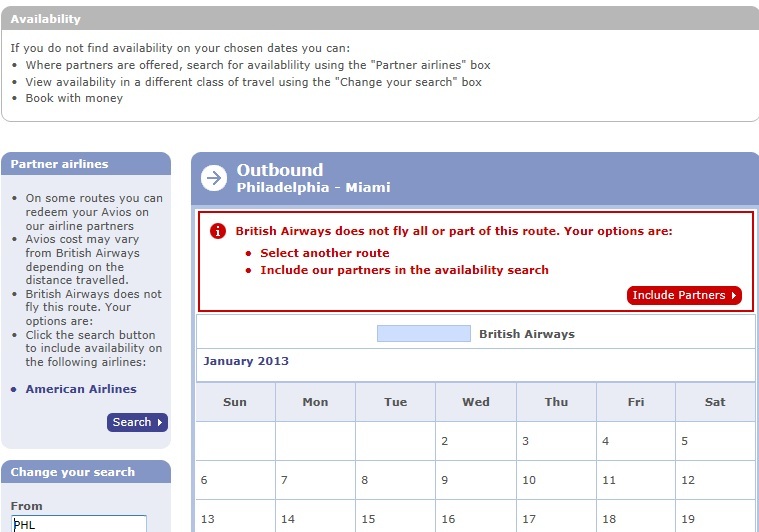 You will get a message that British Air doesn't fly those routes. Select "Include Partners"
Voila! You can now book a flight for 15,000 Avios instead of 25,000 AA miles. You just saved 10,000 miles. We were sitting at dinner last night with some friends and the conversation turned to miles and points. I was trying to explain the value of Bluebird. It got me thinking that I needed to quantify its value and that I needed to take a closer look at my own plan. Like all great points and miles strategies, you need to evaluate whether or not the plan is practical and worth the effort in real life. I am all about ROI (return on investment). What EXACTLY am I getting for the time and money I am about to spend? 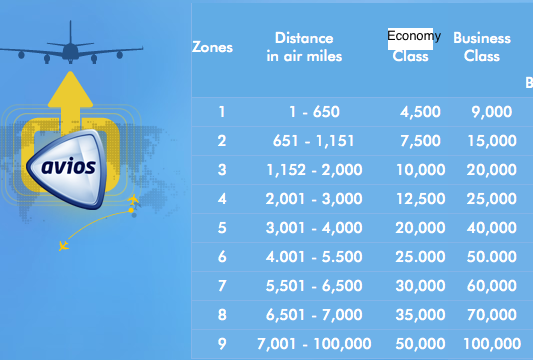 When The Bluebird card was first announced in October, there was tremendous excitement in the points and miles community about the potential to rack up an extra 100K or more miles and points every year. The idea behind this strategy was to purchase Vanilla Reload cards at Office Depot with your Chase Ink bold card. The Chase Ink card earns 5X points at office supply stores. You would then load your Bluebird account with the funds from the 5X purchase. This was a great idea. You would be able to effectively earn almost 5X points on bills that you could not otherwise earn points. Back in October, Office Depot was still selling Vanilla Reload cards. Vanilla cards at Office Depot are pretty much gone forever. Next there was the ability to purchase the Vanilla Reload cards at Pharmacies. The AMEX Hilton card offers 6X Hilton points at all Drug stores and Supermarkets. 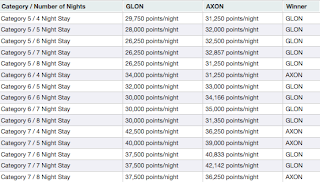 OK, it wasn't 5X UR points any more, but 6X Hilton points are better than no points. CVS and Walgreens are both selling Vanilla Reload cards. Unfortunately, Walgreens has now adopted a policy that those cards have to be purchased with cash. That leaves CVS as the only way to purchase Vanilla Reload cards and earn bonus points with your purchase. As long as you have the Hilton AMEX card it can still be worth it to use the Bluebird strategy to pay bills. I decided I had about $4000 in office bills and $4000 in personal bills that I would be paying each month through my two Bluebird accounts. That means I need to load $8000/ month on Vanilla reload cards and transfer that money into the bluebird accounts. It's probably not a good idea to use one credit card like the Hilton AMEX to purchase $8000/ month in Vanilla reload cards. After all how can you justify to the credit card company almost $100,000/year in Pharmacy bills? If they suspect you are abusing the points system, they WILL shut you down. I decided the best strategy to not draw attention to credit card activity was for both my wife and I to use 3 different credit cards each month for the purchase of those reload cards. We would buy $2000 each on our AMEX Hilton card, and $1000 each on both our Starwood Preferred and Chase Sapphire cards. This would at least spread the charges across different banks and different cards. Right now we both probably stop twice a month at the pharmacy for some purchase NOW, we will each have to make two extra trips each month to stock up on cards. Each Vanilla reload card costs $3.95 cents, making our monthly expense to purchase 16 of them around $63. Annually, we will be spending around $750 just to purchase cards! The question now becomes, Is it Worth it? What EXACTLY will I be getting for my $750 and two extra trips to CVS each month. Let's look and the math to help us make that decision. 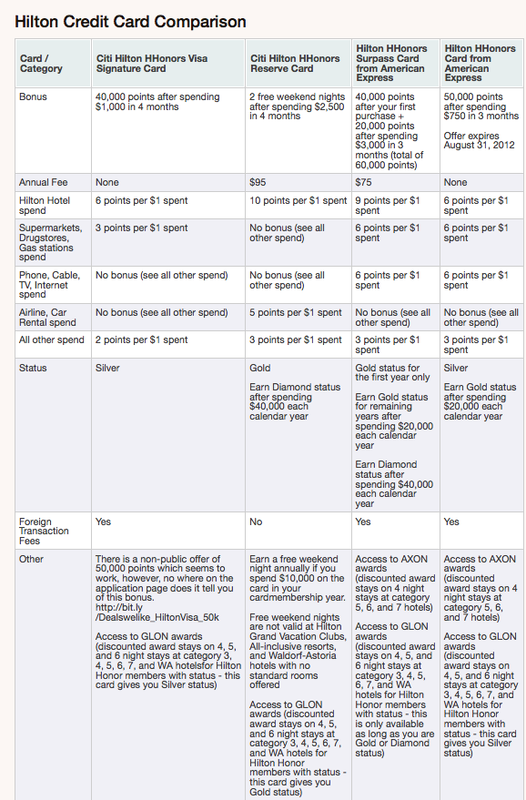 Purchasing $4000/ month on a Hilton AMEX will result in 24,000 Hilton points each month. 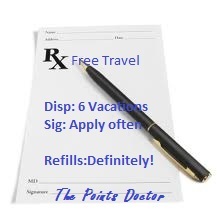 (Pharmacy spending earns 6X Hilton points). That comes to over 290,000 Hilton points/year. Purchasing $2000/month on both the Chase Sapphire and Starwood cards would result in nearly 25,000 Starpoints and more than 25,000 Ultimate Reward points. 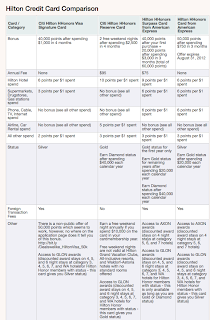 (Don't forget you earn points on the $3.95 fee and UR give you a 7% yearly bonus on points earned) Let's look at how those points can be used to see if it is worth the effort. First of all, let's look at what $750 buys in travel. For $750. you can probably buy two RT domestic coach airline tickets. You might have money left over, or you may need to spend more than that. Let's assume that a Hilton night at a top hotel costs between $250-$350 per night plus taxes. That will buy you more than two nights, but less than 3 nights. What do our points buy? 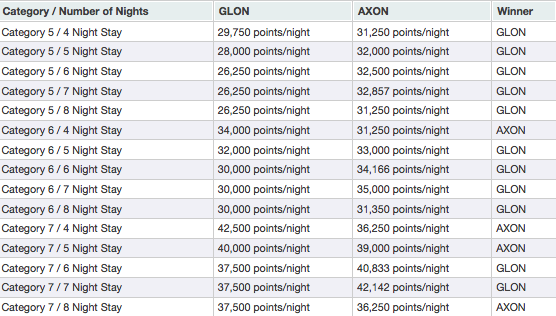 Using your 290,000 points, you could purchase two 4-night AXON7 awards. 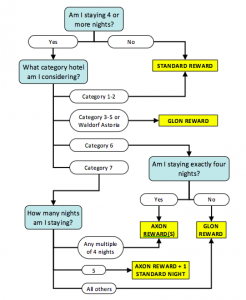 An AXON7 award means that you can stay at ANY top category 7 Hilton with few exceptions. Now that you don't care what the room night costs, you would probably try to get the most bang for your buck and stay at a property that costs $350/night. Those 8 nights could be worth almost $4000 when you add in taxes and fees. Using 20,000 of your Starpoints you could book a domestic Coach ticket on any one of the 31 airlines that Starwood partners with. Transferring 20,000 Starpoints gets you 25,000 Airline miles. Using 25,000 UR points you could purchase over $300 worth of airfare or transfer those to Southwest or United for 25,000 miles. $750 buys EITHER two airline tickets OR 2-3 hotel nights. Your points on the other hand buy two airline tickets AND 8 nights at the top category Hilton hotels. Only you can decide if that is worth the effort. To me, getting an 8-day vacation for two people for $750 and some extra stops at CVS is worth it.